Miami Chaine has supported restaurants, hotels, businesses & industries in Miami Dade County for 50 years. Cheers to our next 50 years! Surprise 'buffet' reception at our Gala 50th! Greater Miami Bailliage (chapter) was founded in 1967 by Dr. Charles Monnin. In 2009, Dr. Charles Radlauer was elected Bailli (president) of our Bailliage with only 37 active members. By reaching out to current & past members with innovative events, our numbers grew. Miami Chaine is unique; since 1970’s, cruise ships grandfathered into Miami Chaîne thanks to Baillis Honoraire Charles Monnin & Elgma Heinze; Maitre de Table Honoraire Rafael Ordonez; Commandeurs Jose Vila & Emil Graf. In 2011, when Charles was elected Bailli Provincial Southeast, I was elected Bailli. Each season, we host 9-11 themed & non-themed events, typically September-April...Informal Amical Gatherings, Annual BYOB, Gala Dinners & Induction, Mondiale (wine) events, blind tastings, Cooking Classes, Cruise Luncheons, World Chaîne Day, & Epicurean Escapes in Hotels, Resorts, Local Restaurants, Private Homes, Cruise Ships, & Country Clubs. In April 2017, we celebrated our 50th Anniversary. Founder Charles Monnin attended along with members from all over the world. 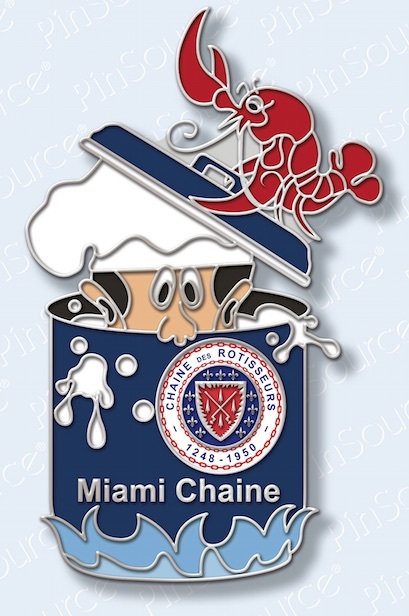 We're proud that Miami Chaine’s prominence has grown locally, nationally & internationally. 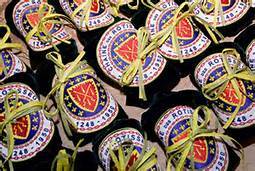 Today, Miami Chaine is the largest Bailliage in the U.S. & the #1 Bailliage in the S.E. Region. I heartily thank our wonderful members for their continued support, membership, & referrals. Created Miami Chaîne Gallery in collaboration with Vice Consellier Culinaire Bruce Ozga, Dean of JWU, College of Culinry Arts. Our memorabilia spans the entire lobby wall & is now an integral part of campus tours for all new culinary students. Created Miami Chaîne Chefs of the Future Scholarship Fund. To date, Miami Chaine has donated over $38,000. Created Miami Chaîne JWU Volunteer program, giving students hands-on opportunities with chefs & restauranteurs. Host spectacular luncheons aboard our cruise ship members. Hosted a fun-filled Epicurean Escape weekend at Ocean Reef Resort, Key Largo. New weekends in the future. CG France Gael de Maisonneuve (2013), CG Spain Maria Barrios ('15), CG Spain Cándido Creis ('17), CG France Clément Leclerc ('17).